I was going through flickr tonight and found a card I made awhile back and never posted. I found this stencil at a scrapbook store in Topeka and knew that I had to have it. 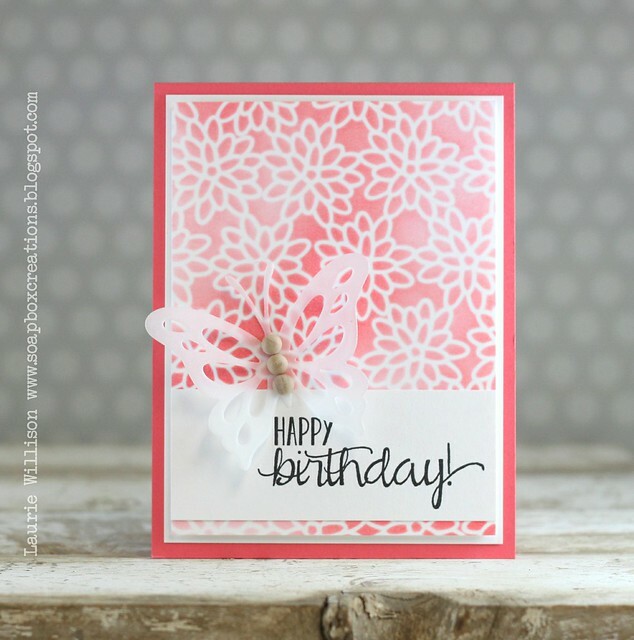 I made up this quick and simple monochromatic card just by layering the Berry Sorbet ink with the Berry Sorbet card stock. (Berry Sorbet has to be my favorite color. Ever.) 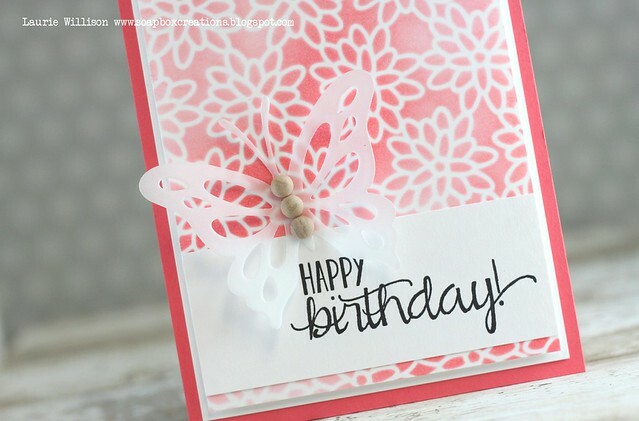 I cut out one of the Butterflies in PTI's fabulous vellum and then added in some wooden dots with a sentiment, from Bigger Blooms, in black to complete the card. Hope you all have a fabulous weekend! I'll be back here on September 2nd with a fun post! Stay tuned! Just playing around with press n seal again over here. Seriously? I love how quick it makes this process. I am all about quick and simple. If you haven't see the Make it Monday video, click HERE to check it out. So first, I took some Soft Pool Hero Arts ink and added a little color to the background. I used the Mighty Bloom cover plate and press in seal to get the next layer. I added in some thread and a piece of Berry Sorbet striped paper and then stapled a vellum banner sentiment to finish the card. The sentiment is from Fancy That. SUCH a fun new set from PTI. Hope you are all having a great day! It's rainy here so we are taking advantage of some indoor crafting time today. Thanks so much for stopping by! All of the Card Hanger Dies are in stock today 9-27-14! Yay! Click HERE to learn more about the dies and for a how-to video. 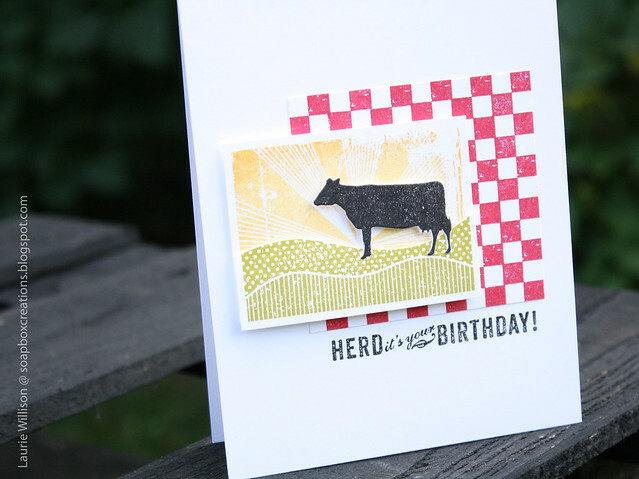 Here is a close up of the Scalloped in use as a card hanger and as a border die! 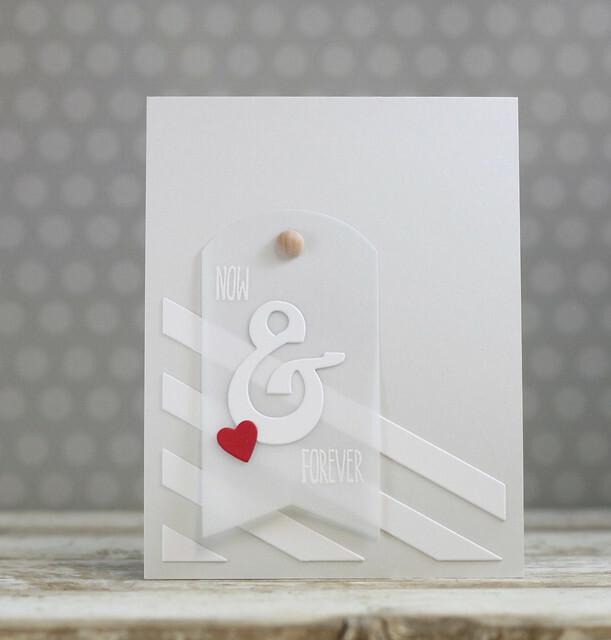 The Scalloped Card Hanger Die is a 2 in 1 die! I can personally vouch for these dies! They are amazing. 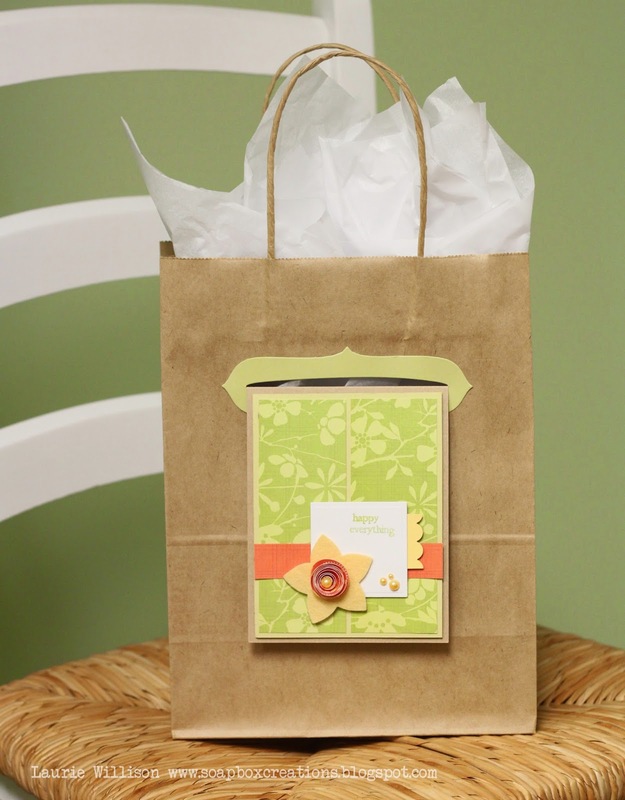 EXCELLENT quality and they make THE cutest, most practical gift bags, EVER! I am ordering the mini. I am, sure it will work great on smaller bags! Thank you Laurie, for a great product! Let me know if you have any questions! OH and all orders that were placed since Monday have gone out today! Thank you so much! Hey there! 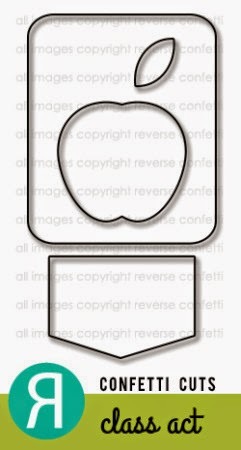 I am back from vacation and will resume shipping of the Card Hanger Dies tomorrow. 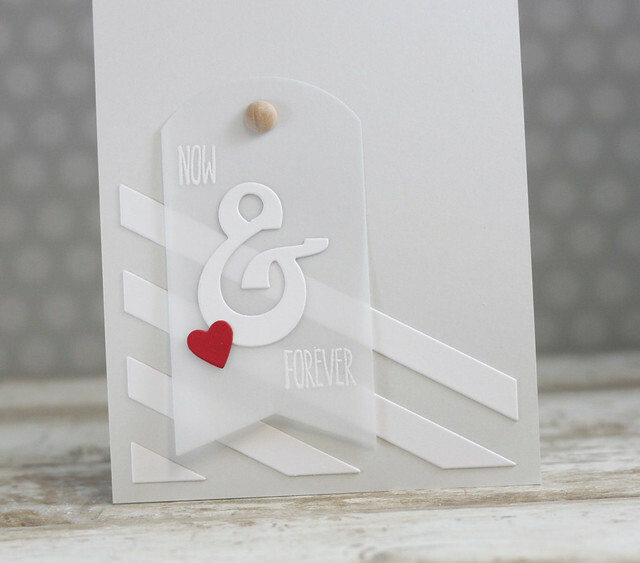 First, I dry embossed a striped panel for the top of the card base. 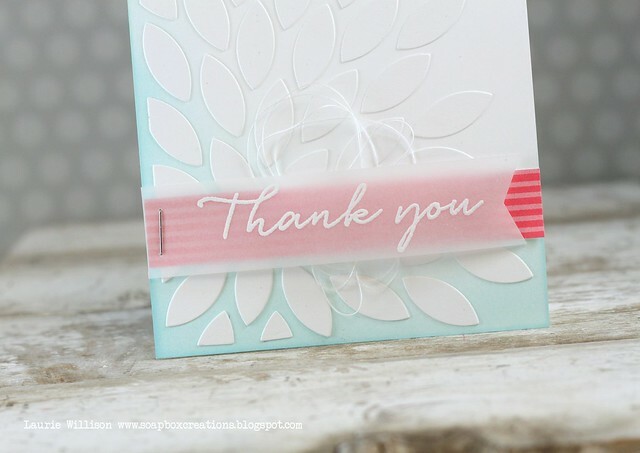 I stamped and hand cut the flowers and leaves and layered them up, curling the leaves at the end for a little dimension. The sentiment is stamped in black and also in Delicata Gold. 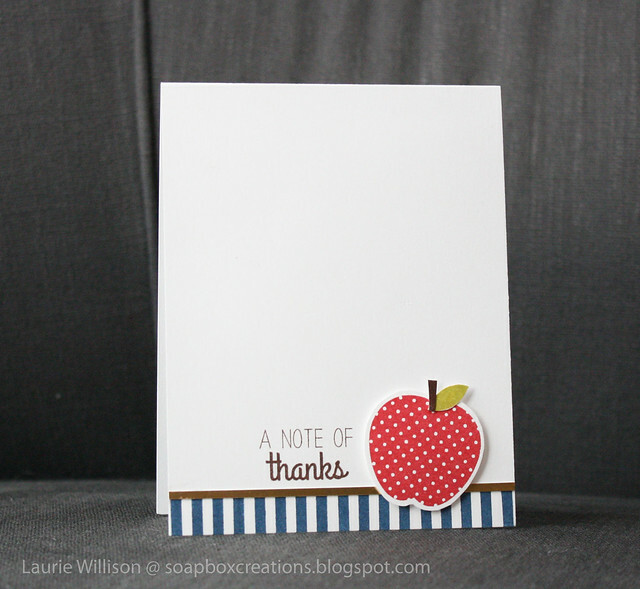 I completed the card by adding in some tiny black dots. 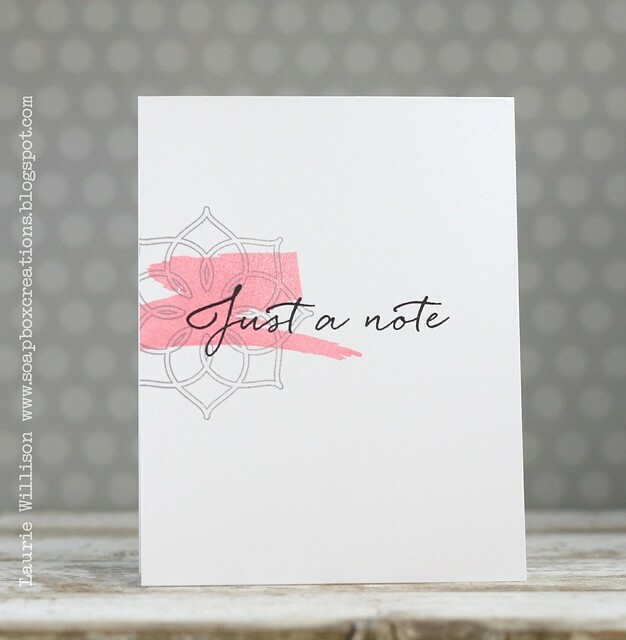 Check out Nichole's blog and the rest of the DT for some more Filled with Joy inspiration. Happy Stamp-A-Faire! See you soon! I can't wait to see what you create! Thanks for stopping in today! 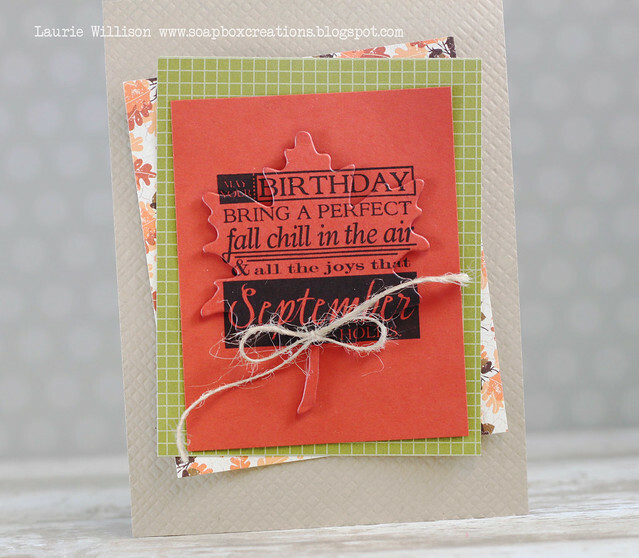 I love these Text Block dies from Papertrey and this new one is no exception! 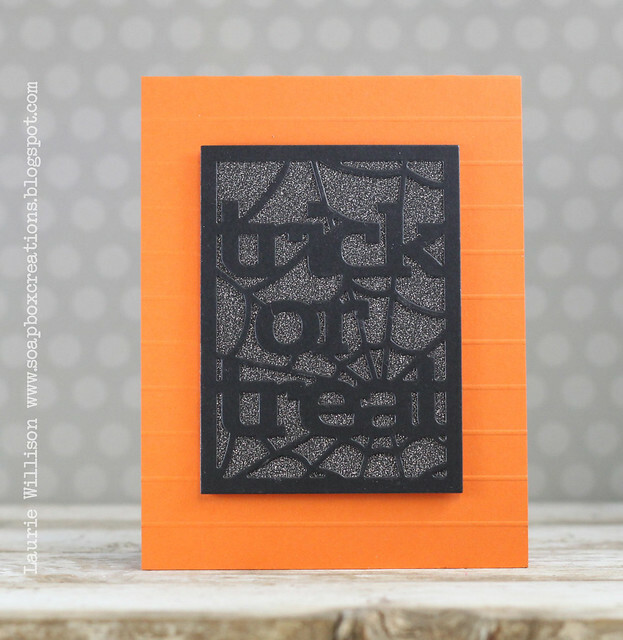 It's the perfect Halloween die for a quick and easy treat card. I die cut the text block in True Black card stock and then layered it up with some glitter paper. I took an orange card base and scored it every 1/2" and then added in the text block with foam tape. And that is it! 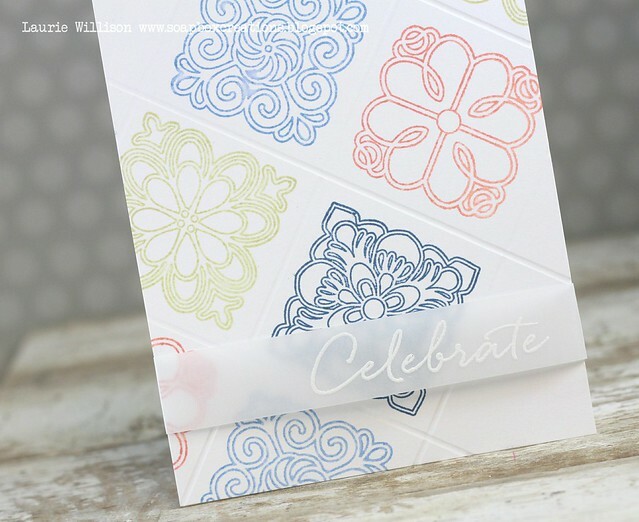 Stop over to the Papertrey Store by clicking HERE, to see all of the new goodies for August. Have you enjoyed the August release over at PTI? I am pretty excited to share with you, the rest of the cards I have for today's release in review. It's definitely feeling a lot like fall on the blog for sure! 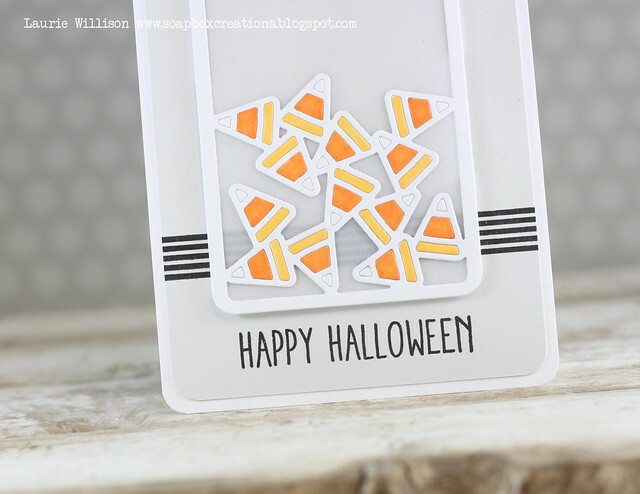 I used the Candy Corn die to make a little decorative vellum panel. The candy pieces all stayed together when I cut it out, so i just added a little copic coloring right on top. I added in vellum in the backgounrd and then popped it up on top of a little Super Stripes detail. 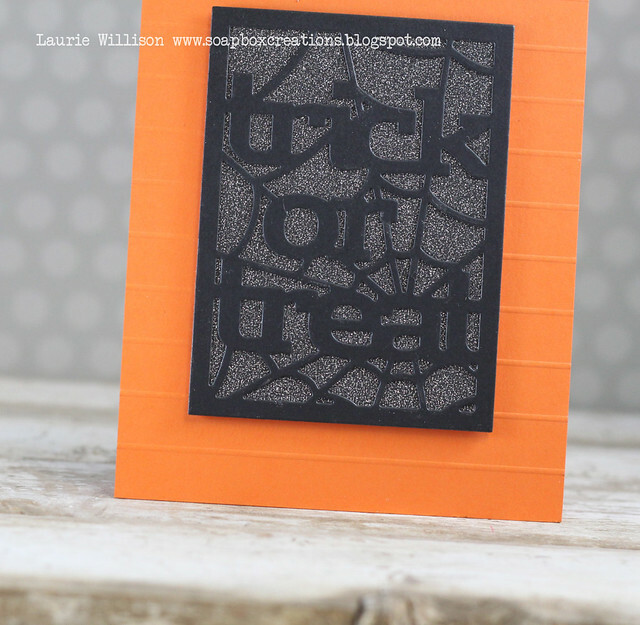 I stamped the sentiment, from Keep it Simple: Halloween in Versafine Black Onyx. 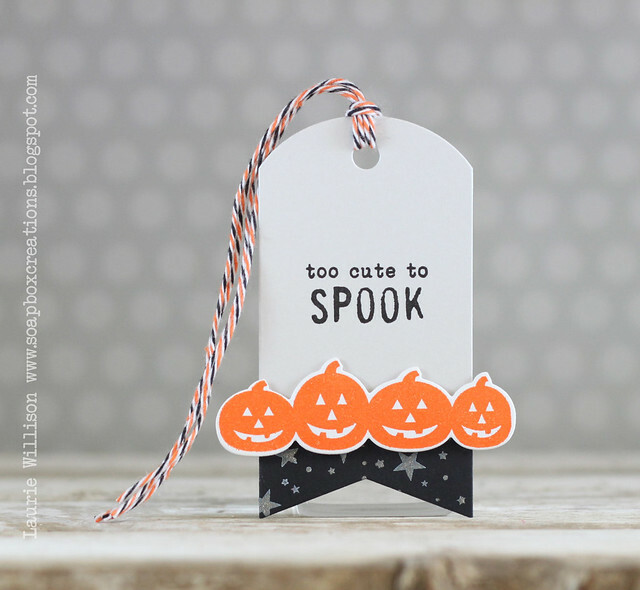 This little tag comes to you from Happy Spooky Halloween and Haunted Borders. 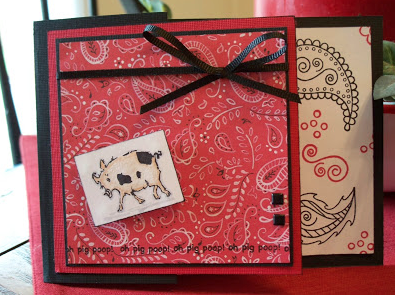 I made a box the other day (click HERE to see) and I used that same paper that I made stamping the stars in white on black card stock for the bottom of this tag. I masked off the edge of the pumpkins on the Haunted Borders so I could just use a portion of the border. 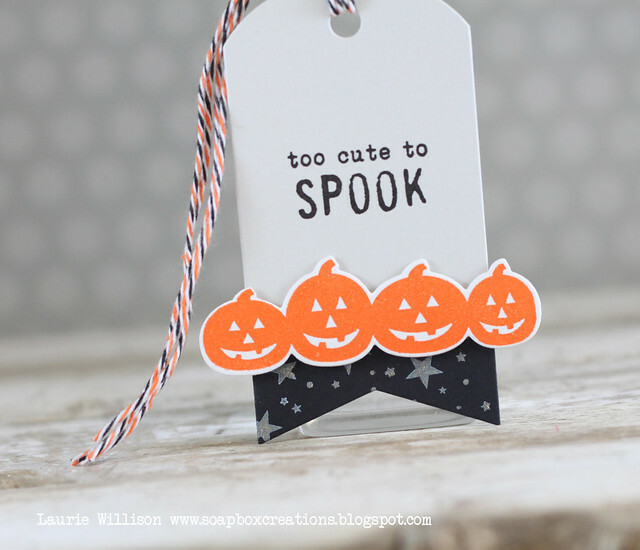 I stamped the sentiment from Happy Spooky Halloween on the top of the tag and finished it off with some twine. 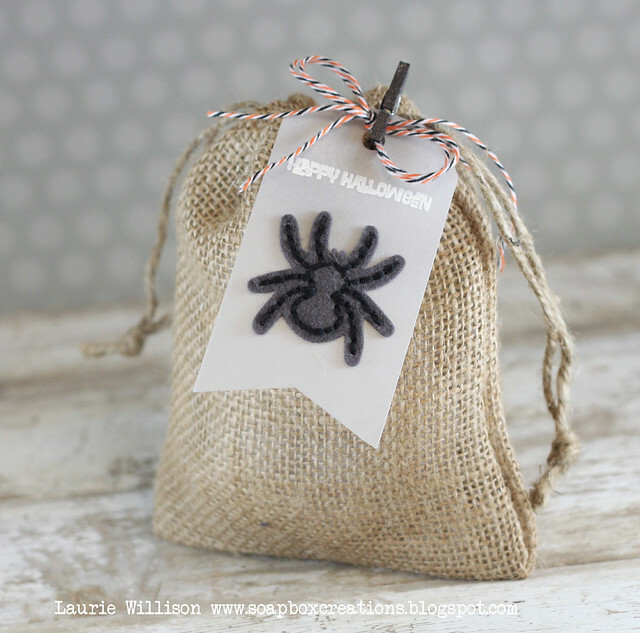 This little halloween treat was made using the new Along Came a spider dies and stamp set. 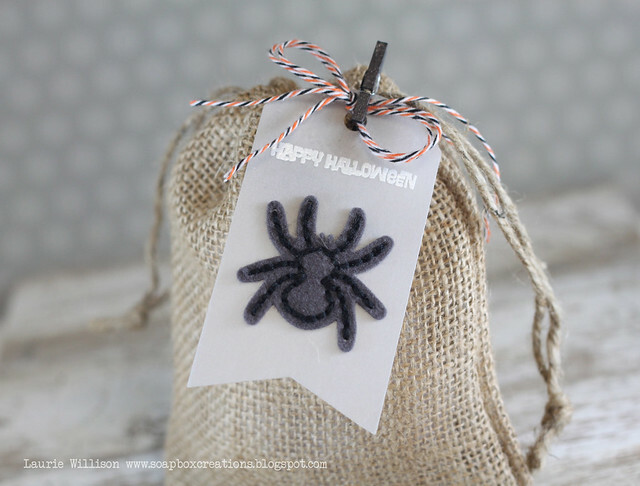 I stitched the spider in Smokey Shadow felt with black floss, right on to the vellum tag. 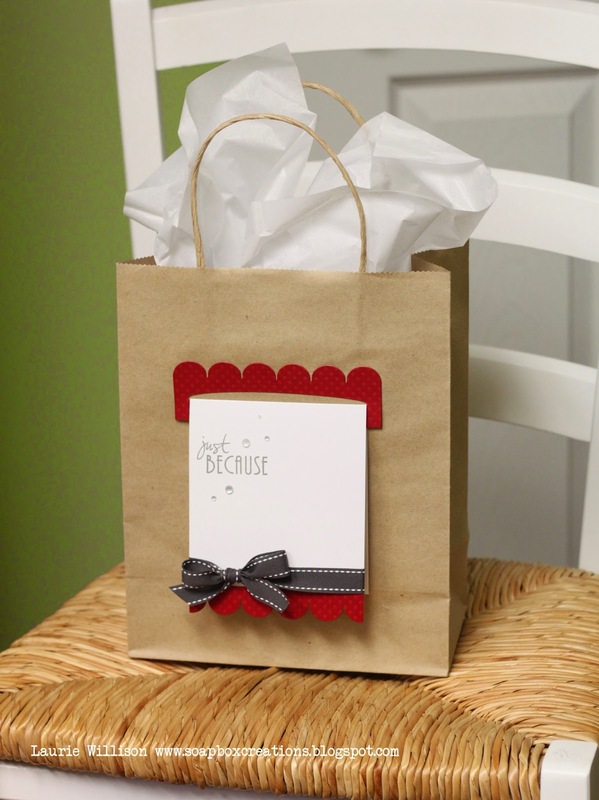 I heat embossed the sentiment using Filigree Embossing powder and attached it with a colic-colored, black clothespin to the burlap bag. I am thinking perfect for another teacher gift this year! I made these little place settings for Thanksgiving and am so excited to use them! I used the Leaf Prints Stitched dies to create the patterned leaves, but instead of actually stitching the leaves, I used a black marker and linked the holes together. I went on top of that with a Clear Gelly Roll sparkle pen to add some glitter. I layered the leaves onto the leaf/acorn image from Autumn Adornments. 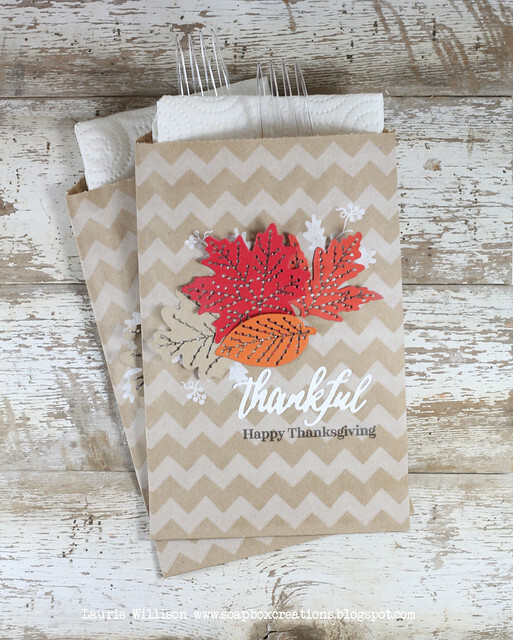 I stamped it directly onto the chevron bag in Fresh Show ink. 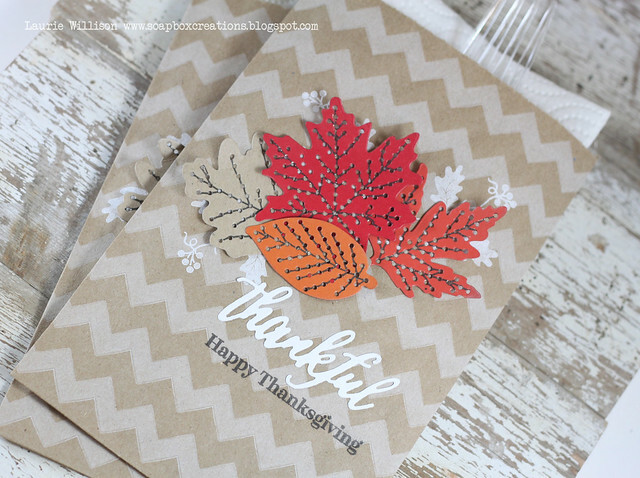 I used the "thankful" from the new Phrase Play die and then stamped "Happy Thanksgiving" from Keep it Simple: Thanksgiving. I added in plastic silverware and napkins. I think these will look so pretty laying on the plates for thanksgiving. 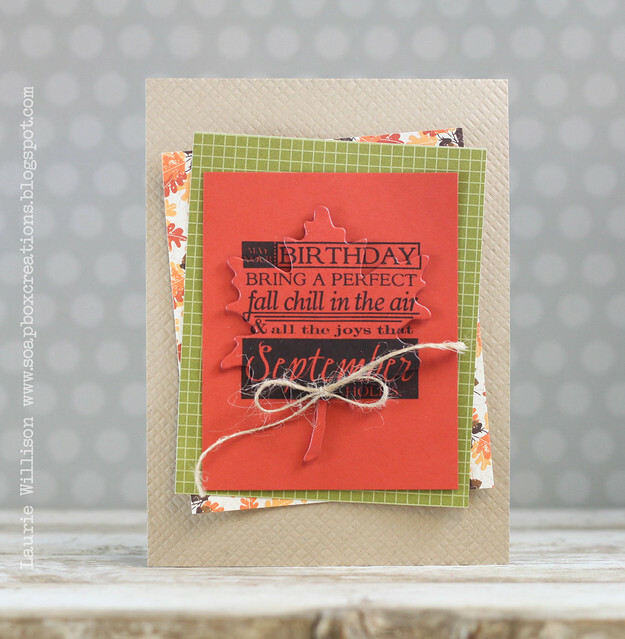 This last card showcases the new Birthday Classics" September. I stamped the main image on some Terrecotta Tile card stock and the die cut it with a Leaf Prints die. 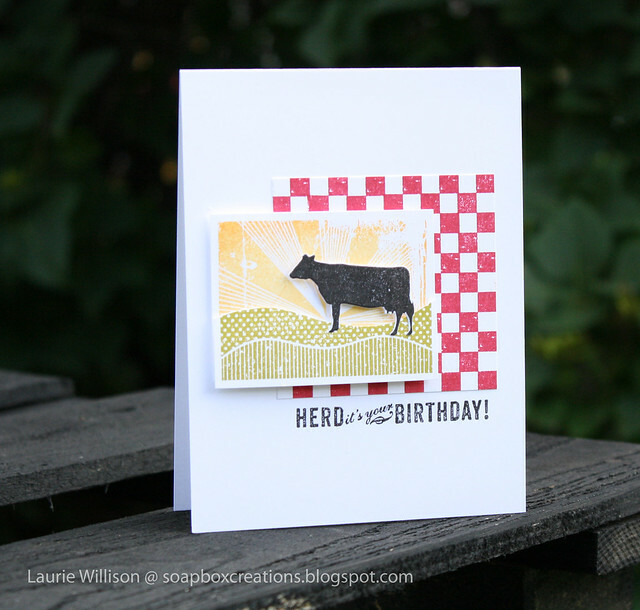 I stamped another image on the rectangle of the same card stock and layered them up with foam tape. I used some Ripe Avocado Bitty Boxes paper and some Autumn Abundance papers and layered them all up on top of the Burlap impressed, kraft card base. I finished it off with a little twine bow. I am sitting here typing this up while I watch My Big Family Renovation on HGTV. Have you seen it? I adore Jen Hatmaker and her blog....and now her TV show. So if there is typos in this post...I'm sorry! I am watching and typing at the same time. lol! Well, I hope you like my cards today. Are you ready to shop? :) Stop in and tell me what is on your wish list so far. 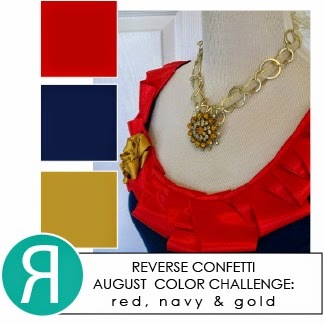 Stop over to Nichole's blog to see what the rest of the team has for today. 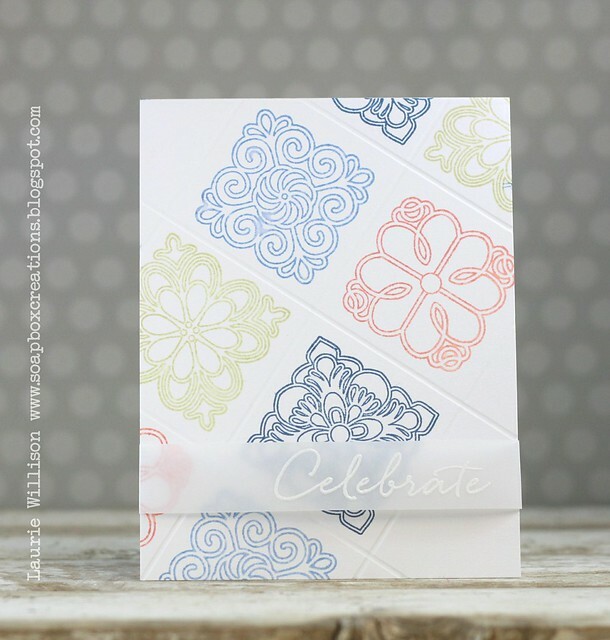 Welcome to the second group post for the August Papertrey Ink release! 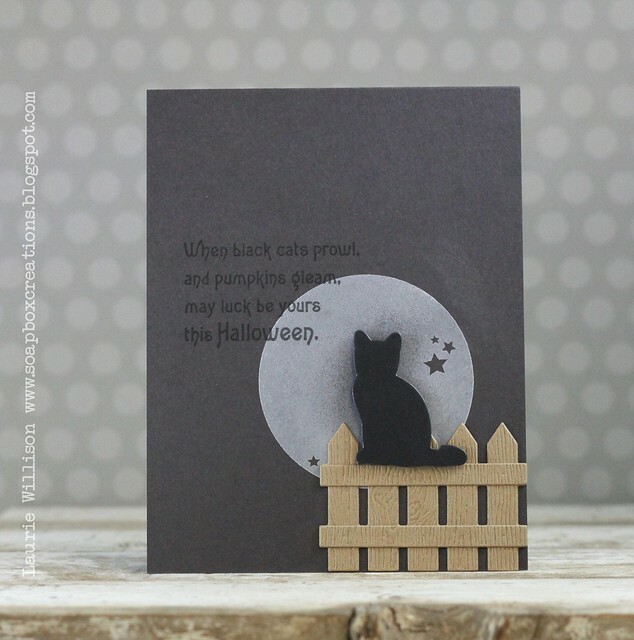 Today we have an adorable new set just in time for Halloween and an add on set, to make these cats fun for any occasion. 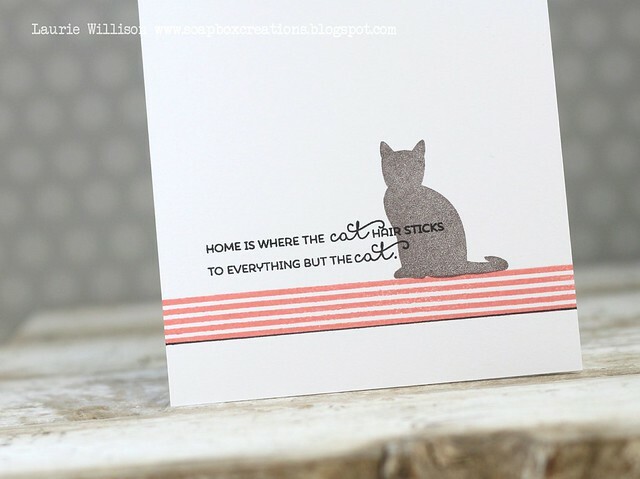 First, I stamped the stripes from Background Basics: Super Stripes, (yes. it is my favorite set.) in Melon Berry ink. I used a ruler and added in a line of black ink at the bottom. 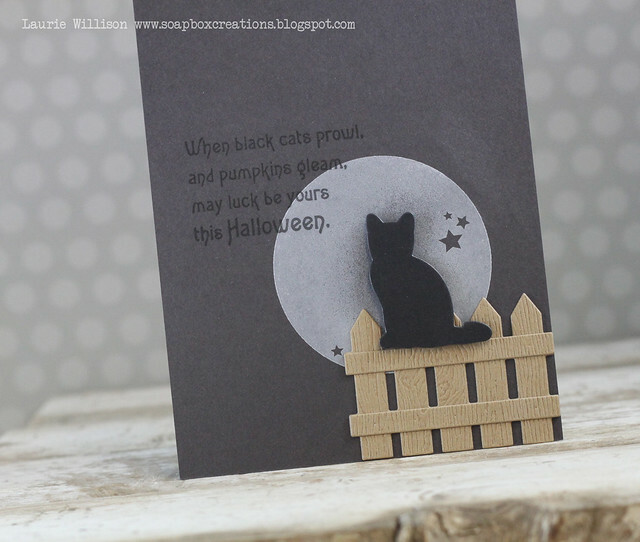 I used Smokey Shadow ink for the cat silhouette, stamping off and then on to the card from. 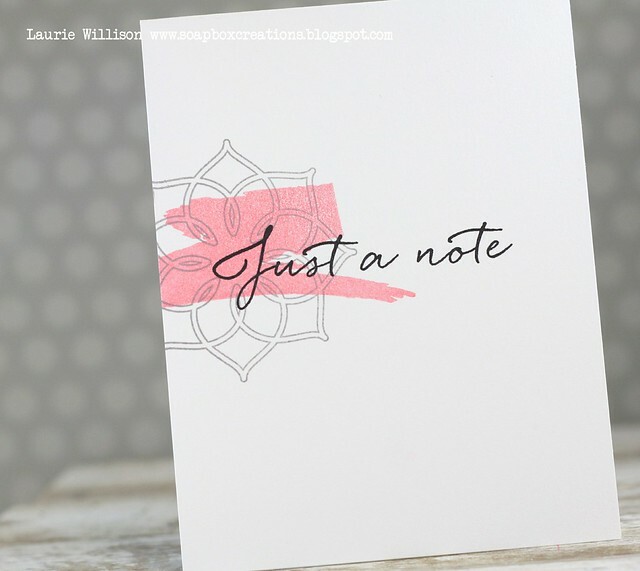 Last, I stamped this super fun sentiment in black ink. These cat silhouettes are adorable! 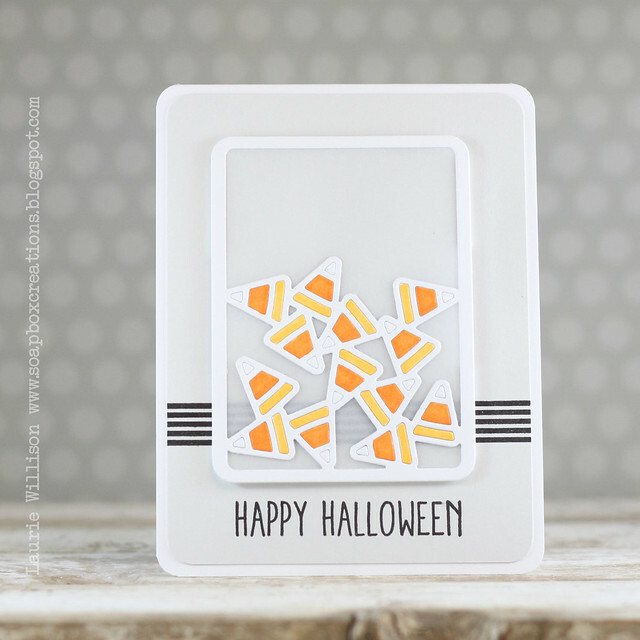 Here is a quick and easy Halloween card.. 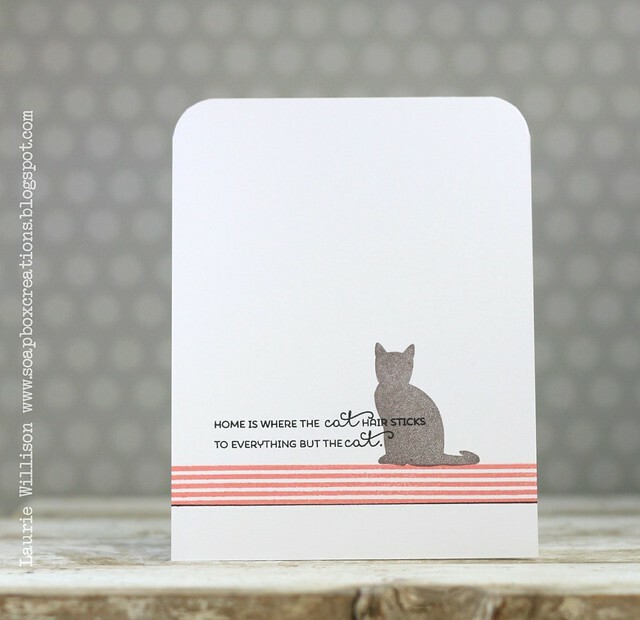 I stamped that amazing moon image, from the new set Full Moon, in Fresh Ink, onto the Smokey Shadow card base. I added in a sentiment in black in, from the same set. 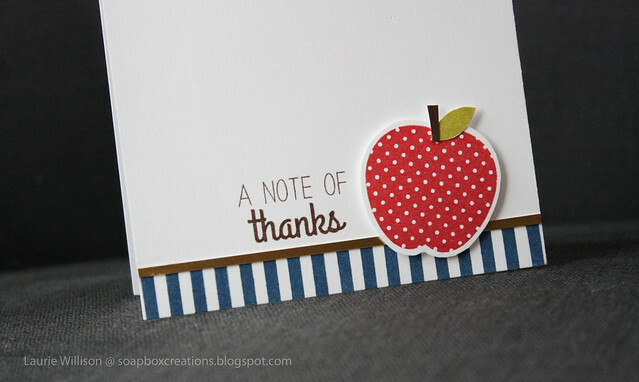 I used the little fence die and some woodgrain card stock and added that on to the card. I cut out the cat silhouette and popped him up on the fence using foam tape. Easy peasy! The other girls have lots to see! Thanks so much for coming by today! Stop back by again tomorrow to see the whole release in review.